2012 and 2017 side by side. The 12 has a ton more raisin, dark fruit and Belgian yeast esters. The 17 has some anise, dark fruits and Belgian yeast. Honestly, think I like the 2012 more. It has more dark fruit flavor. Smoother. BB 7-6-2015; oops! DFH Tulip. Appearance: Well, I really screwed this up trying to decant it, and ended up spilling about 2/3 of the bottle, and creating a massive Belgian foam mess all over my kitchen. Needles to say, what ended up in the glass did not have much head, though I imagine based on what was in the decanting bottle, that there would have been about 3 fingers of frothy tan head had I not screwed this up. Pours an opaque dark brown with some translucency at the edges. Surprisingly, no lacing, and virtually no retention. Even what was left in the decanting bottle after the spill didn't retain much head. Aroma: It was chilled for the decanting process, but has warmed up significantly. 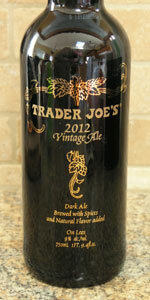 Initially, very earthy, malty tones, with some light fruit and spice. As it warms, the traditional Belgian phenolics come through more prominently: grape, plum, and banana. There is a restrained, spicy complexity underlying it: sandalwood, cinnamon, nutmeg. I would not say clove, though there is a sweetness that pervades the aroma. Surprisingly earthy/woodsy. Taste: Slight malty sweetness on the arrival, but much less so than I remember the 2011 or 2010 being. As it crosses mid-palate, it transitions into a fruit explosion. Red grape, raisins, plums, really fruit salad-y. Kind of syrupy in sweetness, but not in texture. As it transitions toward the end, really turns earthy and woodsy. That fruit-to-earth transition is perhaps my favorite part of this beer. A dried fruit sweetness and tartness lingers after the swallow. Mouthfeel: Incredibly soft and smooth across mid-palate. Just this side of syrupy. Very low carbonation (my fault, I assume). Seems lighter and more drinkable than my prior experiences with Belgian strong dark ales. Overall: I really screwed up the appearance and mouthfeel by spilling it not once - but twice - in trying to decant it into a smaller bottle. Lessons learned. But in terms of taste, I can say that this one seems way less sweet than the 2010 or the 2011, and I like that a lot. It also has an earthy note, and I can't tell whether that comes from the fact that it is past-date, or because it is by design. Either way, it is a very satisfying BSDA, as compared to the 3-4 others I have had. I didn't get this in 2014 or 2015, but maybe the even-number year, gold bottles are the ones to get. Had this aged 3 years, and side-by-side with '13, '14, and '15. That being said, it was a toss up for the best along with '14. Plenty of raisin and spice, and everything nice for welcoming the winter. Cheers! Dark brown with cola colored highlights. Ashen head fairly tall with some lacing. Dried fruits dominate the nose and taste but very subtle. Watery feel was not enjoyable. Aged till 8/30/15 in a wine cellar. Easy drinker. Apparently, I didn't review this fresh, so I'm going to review my personally cellared 2012 edition 2+ years after the fact. Aside from the champagne-style cork disintegrating in my hand as I try to open the 750mL heavy brown glass bottle, it seems no worse for the age. Beer pours rich dark brown in color, supporting an ample head. Gentle aroma of raisins and dark fruit. Flavor is similarly rich and demands to be warmed up, in order to bring out classic Belgian Brown ale flavors. Raisins and prunes are complemented by licorice and spice. Very mellow and drinkable. I don't recall if it was this mellow when this winter seasonal was first released, but it sure is now. Just popped one open after storing since 12/2012 in my closet today is 11/7/14 . Which hit various temperature changes from 60-80 degrees. I know that's not recommended but wow surprised to see it held up. I did the same for a 2013 as a test I opened early and they weren't ready to drink a bit bitter but still good. This year I'll buy a 2 cases of 2014 and enjoy throughout 2016 year. Keep in mind there are far better beers out there but! For the price I can afford to house these for a while till my 2013 are ready. Color pours dark brown. Malty,Taste of cinnamon, wood, raisin, smells sweet and strong. I'm no beer professional but in training. If you want to blind test a friend for a taste test at a party or open up any year as a conversation piece just pick up one of these. I've paid 20 dollars for other pieces and nothing beats this price and quality. (Good job trader joes! Where I can eat healthy and buy decently priced beers and wines while shopping) if your not picky, 2 and a half of these will put u to sleep like a baby. Try it! Oh! And a great inexpensive gift for crafty beginners.